While speed isn’t the be all and end all of a good website, it does play a major role in its overall success. Why is this the case? Because how quickly the pages on your site load directly impacts how visitors experience them. We’ve all been stuck on sites before that take forever to load and they’re no fun! So why do that to your visitors when there are relatively simple solutions available? WordPress can get bogged down pretty easily — if you overload it with plugins, especially — but there are a few plugins out there that make speeding up your site their priority. And trust me, the effort you put in on this small step will pay in dividends for your end-user’s overall site experience. What follows is a collection of plugins that use a concept called “lazy load” to reduce overall page load times by only loading certain page elements when they become visible in your browser. I think they’re worth checking out. 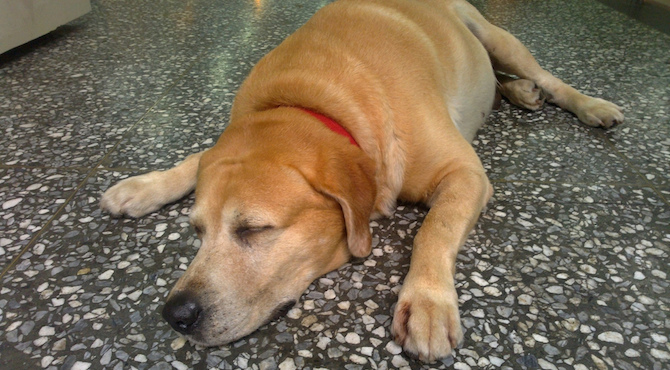 The aptly named Lazy Load plugin was developed by a highly reputable crew made up of people from Automattic — the folks behind WordPress — Jake Goldman of 10up LLC, and the TechCrunch 2011 Redesign team. It focuses solely on images. This plugin actually relies on jQuery.sonar to load images only when a user scrolls down to them in a browser. So, they don’t load until they’re within view. As you can imagine, this improves how quickly a site loads but it also improves server bandwidth. If a visitor doesn’t scroll down all the way to the bottom of a page, those images aren’t loaded. Since they’re never called up, you use less bandwidth. It’s a simple concept but important in its overall effect. If you anticipate having more complex needs, the WordPress Advanced Image Lazy Load plugin might be a better option for you. What qualifies as “more complex needs?” Let’s say the site you’re working on is for a photography firm. This site is bound to be image heavy, which means slow page load times are the default setting, right? They don’t have to be! This plugin is straightforward and works by only loading images as the visitor scrolls down to view them. What makes this special, however, is that it works for any image on your site within an img tag. This plugin is an especially good choice for portfolio sites. It will set you back $12 but it lets you preserve the quality of your images and reduce site load time, which just might make it a worthwhile investment. Variety is the spice of life, so what would this list be without an alternative image lazy load option? 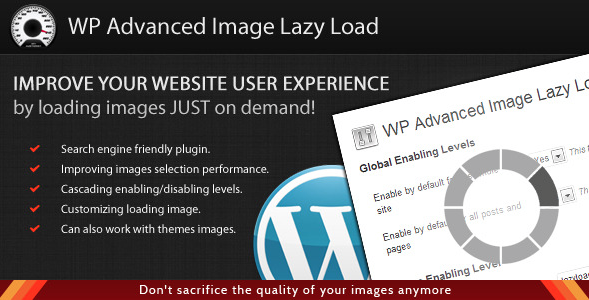 That’s precisely what the jQuery Image Lazy Load WP plugin offers. It adds straight froward jQuery lazy loading to images. That’s it. No more, no less. If you all you need is a minimalistic option that gets the job done, this is your plugin. In fact, the script is only 2kb, so even the plugin itself is optimized for speed. It works by cutting down the number of HTTP requests required to load a page. All regular images, images in widgets, avatars, thumbnails, and even smilies qualify. If you don’t feel like messing with a bunch of settings, you’re in luck: this plugin doesn’t have any options at all. Just install it and you’re good to go. Most of the lazy load tools available are focused on images. But what if you offer a more immersive multimedia experience on your website and feature videos, too? Videos are even bigger server hogs so all the image optimization in the world wouldn’t fix a site that’s bogged down from videos. Thankfully, there’s the WP YouTube Lyte plugin. It’s a good choice for sites with a lot of video content. It allows your videos to load only when a user clicks on them. This is accomplished by inserting Lite YouTube Embeds. These embedded videos look like regular YouTube videos but you won’t get a preview image of what will play until you click. Since the videos don’t “preload” before a visitor actually wants to watch them, you save server bandwidth and reduce page load time by a ton. This is especially applicable to sites that have a lot of videos embedded on each page, not just site wide. The last plugin I’m going to talk about today is the Lazy Widget Loader. After all, if you’re going to ensure your images and videos load only when they’re needed, why not apply the same principle to your widgets as well? It works the same as the others: the plugin postpones the loading of widgets and their content until they are within the viewport on screen. What’s particularly nice about this one, however, is you can pick and choose which widgets it applies itself to. This way, you can opt to have the lazy load feature applied to just those widgets that are slow or bulky. Such widgets typically include those that call up external data to load like AdSense, Twitter, Facebook, and so forth. The main content of a page loads first, giving viewers something to look at immediately. Only then are the widgets called up. This plugin won’t override any settings, either. It is only applied to the widgets you designate within the plugin’s settings, end of story. The concept of lazy load isn’t new, but it’s often overlooked. Why? Because the emphasis is so much of the time placed on optimizing specific site elements. You run images through tools like WP smush.it. You install caching tools like W3 Total Cache. You minimize the number of plugins you install. The list goes on and on. But it is through the use of lazy load tools that you can speed up your WordPress site considerably. This will optimize the performance of your site, of course, but it also has the added benefit of improving the overall end-user’s experience. That’s something I think is worth investing in, above all else. But what do you think? What lazy load plugins or tools do you use on your site, if any? Is it a priority for you? Or do you achieve better site speed through other methods? In any case, I’d love to hear your input so feel free to comment below! Images are most important part of any website, I think every blogger should optimize images for each post, there are many WordPress plugins available to optimize images but personally I like to use online image optimization services to quickly optimize images for each blog post. It takes few seconds to optimize images for each blog post, and you can remove an extra plugin from your site as well. 🙂 I am also using Lazy Load plugin. Went thru your list, thank you for the reviews. Found a new one that is being supported very well and works like a charm. Lazy Load XT. Thought I would give him his props as overall it beat out the others in my analysis. Handles YouTube Embeds as well as Images. Great support! There is another lazyload plugin and it’s very lightweight. Unveil Lazy Load: https://wordpress.org/support/view/plugin-reviews/unveil-lazy-load. I am using this plugin for my wordpress site and it worked well. Indeed. I agree. The ‘Rocket Lazy Load’ works but ‘BJ Lazy Load’ works much better. Also, ‘lazy Load’, which is listed at top – is not updated anymore. Thanks Tom for this Great Collection. Really Useful List. Thanks Again Tom. Signed Up for your Newsletter. Thanks for this review but honestly, talking about lazy loading without addressing the issue of SEO and google crawlers is of little interest. Hi, is there anything by which I can lazyload the thousands of comments in a single post? I need it badly to reduce the page load time. BTW, I am using wordpress native comment system. I wanted to lazy load embedded videos but haven’t found a really simple solution. I was annoyed by those plugins who require a “httpv” in front of the URL. So I developed my own plugin, Lazy Load for Videos, and with nearly 15.000 downloads from WordPress.org it performs really great. … and feel free to contact/interview me for an article! Sorry to hear that Max! Hope the new plugin works for you! Lazy Load and the caching plugin WP Fastest Cache have really worked well for me, speeding things up and helping to move my website up the SERPS. Your newsletter and these articles a very useful… keep them coming. That’s great news! Thanks Chris! Thanks for this article… however I tried three of these without much success. Finally I found Bj Lazy Load plugin and this was first one that works as described.